I have a friend up in Vancouver to whom I occasionally give one of my 360 games that I've finished playing. "Wow Kim. That's awesome. I wish there was something *I* got from my work that I could give you in return"
My friend is a plastic surgeon. 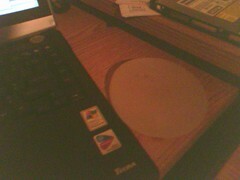 This week, a breast implant arrived as a gift. "Makes a nice paperweight" I was told. I'm trying to use it as a wrist-rest for my mouse hand, but I find I'm occasionally finding my hand has left the mouse and is clutching the pseudo-mammary. Kim! Put the breast down, and get on with some work! how tasteless. this is disgusting, how could you stoop to this level?